This dish has quickly become a household wintertime favorite. The original recipe that this one is based on comes from the Joy of Cooking although it has evolved quite a bit since then. The nice thing about this recipe is that it is easy to get creative and come up with your own combinations of flavors. Have fun and enjoy! Halve and seed squash. Place a steaming basket in a pot with water (be sure to not allow the water level to be higher than the level of the bottom of the basket). Bring the water to a boil and add the squash halves. Cover and steam until soft, usually 10 to 15 minutes. Rinse 1 cup quinoa in a fine-mesh sieve and drain. In a medium sized pot heat oil or butter and add chopped onions and garlic. Cook until golden. Add quinoa, toasting for about 3 minutes. Add broth and other seasonings (I used coriander and turmeric… just get creative). Bring to a boil and reduce the heat. Cover and simmer for 12 – 15 minutes until the liquid is gone. Meanwhile, in a medium skillet cook sausage. Add chopped kale, stirring until wilted. Turn off heat. Combine quinoa mixture with sausage mixture and parmesan cheese. Make any final seasoning adjustments. 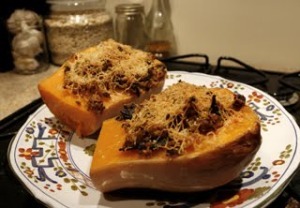 Spoon into squash halves and place in baking dish. Top with remaining grated Parmesan. Bake until heated through, about 20 minutes.